Charity Team Building | Corporate Charity Events | WILDLY DIFFERENT! A Towers Perrin study found that corporate social responsibility is the third most important driver of employee engagement overall, proving that charity team building activities affect the bottom line. 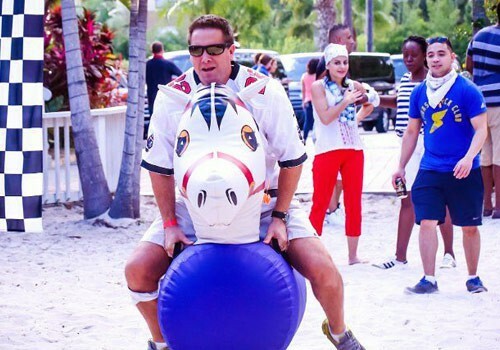 Wildly Different produces a variety of charity team building events that were developed specifically with corporate social responsibility in mind. 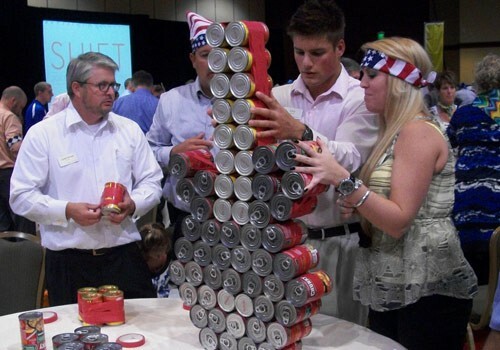 Teams display their “can-do” attitude by using canned food to create either a sculpture, carnival game, or mini golf hole. After being judged for creativity, the cans are donated to a local food bank. If the Canned Goods Carnival or Mini Golf For Good are selected, teams play the game or a 9-hole round of mini golf when complete and an additional prize for highest score is given! This competitive, fast-paced event takes all the best elements from game shows and physical team challenge events and combines them into one really fun charitable event that ultimately results in care packages that benefit a military non-profit such as the USO. Teams compete in games and challenges sure to bring back childhood memories as they “earn” supplies towards cheer packages that will be donated to brighten the day of children staying in a local hospital. 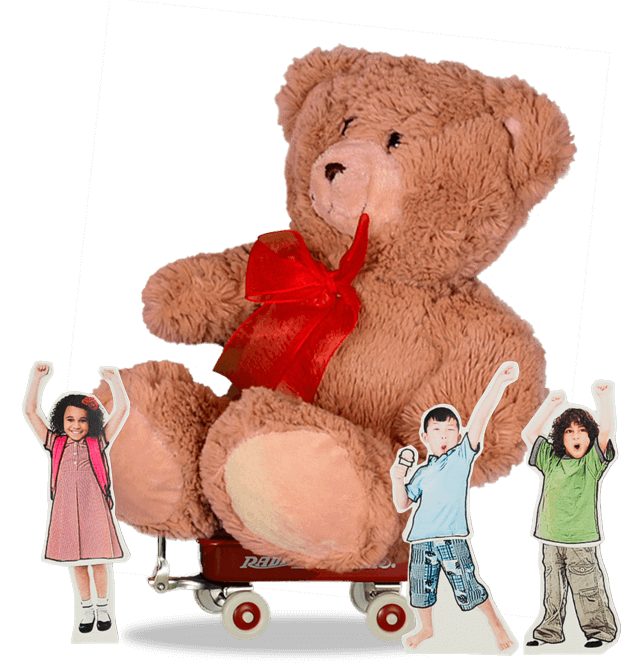 In addition to the cheer packages, decorated by attendees and filled with books and activities, participants also assemble teddy bears for the patients. Teams complete tasks such as answering toy trivia questions or guessing the title of the children’s book by viewing a portion of its cover to earn supplies to assemble comfort kits. These kits contain comfort items such as a stuffed animal, a bright and colorful no-sew blanket and books. All items are assembled and put into bags that are decorated by the attendees. Comfort kits can be donated for children entering the foster care system or for pediatric patients in a local hospital. Teams explore the event area using a GPS-driven iPad app to “unlock” a variety of fun challenges themed to philanthropy and a sense of community. When they’ve successfully completed enough tasks, they also unlock donations that will help a local non-profit. Guests fashion necklaces, bracelets and more for women who need professional clothing and accessories to reenter the workforce. Which team will be the “ringer” that goes home with the prize for best design? Teams gear up to have some fun as they build a bike and decorate it. 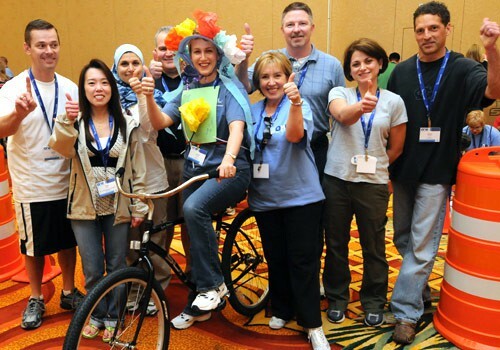 When the build a bike portion is complete, they are judged for creativity and donated to children in need. Before teams begin, however, they must earn their build a bike supplies by completing a variety of mental and physical team challenges. Attendees work together with their teams to win rounds of games themed towards the charity. At the end of each round, the winning team chooses a box from the stage. Each box represents items that will be donated to a local non-profit after the event. The value of the items in the chosen box determines the points given to the team. At the end of the event the team with the most points wins and so does the charity, which gained exposure for their cause and all of the donation items! Teams work together to turn black and white pre-designed canvases into colorful, cheerful works of art. These canvases are donated through The Foundation for Hospital Art to a hospital, clinic, nursing home, or shelter. This care packages event is a fun twist on the traditional. Teams stuff drawstring backpacks with non-perishable food items for children in need. And, in order to earn the food items, teams must compete in a series of games that are sure to bring back fun memories of their own childhood! Want to make a global impact with your give back event? Then this event is for you! Teams utilize a data-enabled iPad to explore the event area to unlock challenges related to Health, Education, Shelter and Environment, and Food. All points earned get translated into global impacts such as maintaining a school water pump in Tanzania, giving Malaria treatment to a child in Kenya, or planting a tree to support reforestation in Indonesia. This flexible event can be designed for teams to explore the outdoors in a city center or around a resort or to take place inside a ballroom. Nothing puts a smile on your face like playing with your pet. But, a close second is playing games with your colleagues to earn donations for a pet shelter! Your guests can plant some sunshine in the life of a local senior citizen by simply spending a couple of hours having fun with your colleagues. Participants decorate terracotta pots that will later be delivered to a local nursing home. The blooming plants inside the pots will provide long lasting “sunshine” to brighten the room of each recipient. Teams test much-needed, brand-new sports equipment in a series of relays before handing it over to a charity that desperately needs it. Kids from the charity can even be on hand to help their team win the day. The race is on to provide relief for the type of charity that is near to your heart – choose from schools and students in need, the homeless, or animal shelters. Teams build racecars out of the supplies provided and a variety of donation items. After the cars cross the finish line they are disassembled and donated to a local charity. Teams assemble bookshelves, stuff reading buddies (teddy bears), and participate in challenges such as literature-based trivia and “Book Bingo” to win books. The team collecting the most books wins! All items are donated to local charity to encourage success through literacy. 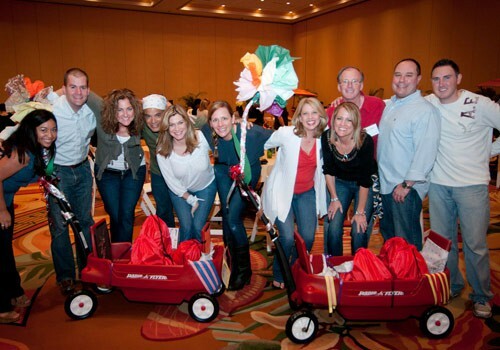 Teams assemble and decorate wagons for kids in need to play with. Next, they compete in challenges reminiscent of favorite childhood games to win points for their team and toys to place in their wagon. Your group can provide shoes for local children in need and also benefit those in other countries. 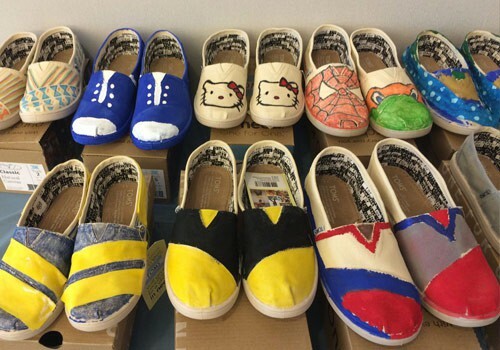 Turn a pair of plain canvas TOMS shoes into a work of art that any child would be excited and proud to wear. Fabric markers, paint, glitter, and other decorating supplies will be available as guests put their personal touch on a pair of TOMS shoes. We’ll deliver the designed shoes to a local non-profit organization to distribute and TOMS will match that donation and distribute shoes internationally through their One for One program. Teams rotate around the event venue competing in a series of toy and game themed challenges. Each challenge represents toys or games that will be donated to local children in need. 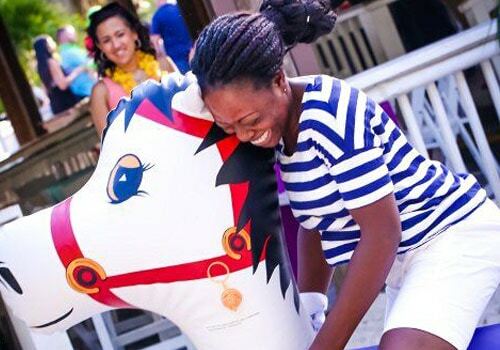 Participants may have to slide playing pieces across an oversized playing board reminiscent of Sorry, or ride on an adult sized pony hop in a relay race, or knock down little green army men by hitting them with marbles as they roll out of the hole of a pool noodle. One winning team will be declared but the real winners are the children who receive all of the fun donations. Plan Your Charity Event Today! The goal was to rally a team of 75 people to help build furniture, stuff teddy bears, assemble and deliver care packages full of necessities to give to local families in need. Working with the local community’s family services department, the team went to work assembling desks, dressers, tables and chairs. For those who weren’t “mechanically inclined”, we had teddy bears they could stuff and care packages they could assemble with items the families needed. The team also played games to win items to donate to the families, such as drinking glasses, cutlery, gift cards, a bike, etc. Ready to Plan Your CSR Event? Contact Us Today.